You may think that Back to the Future’s many home video releases contain enough bonus features to cover everything related to the trilogy, but Back in Time proves that there’s still more territory to explore. In this case, the Kickstarter-backed documentary looks at the movies’ place in our culture 30 years later through interviews with not only many of the cast and crew but also super fans who show their love in various ways. It’s hard to imagine there is anything I don’t already know about Back to the Future, but 30 years later I’m still obsessed with it. 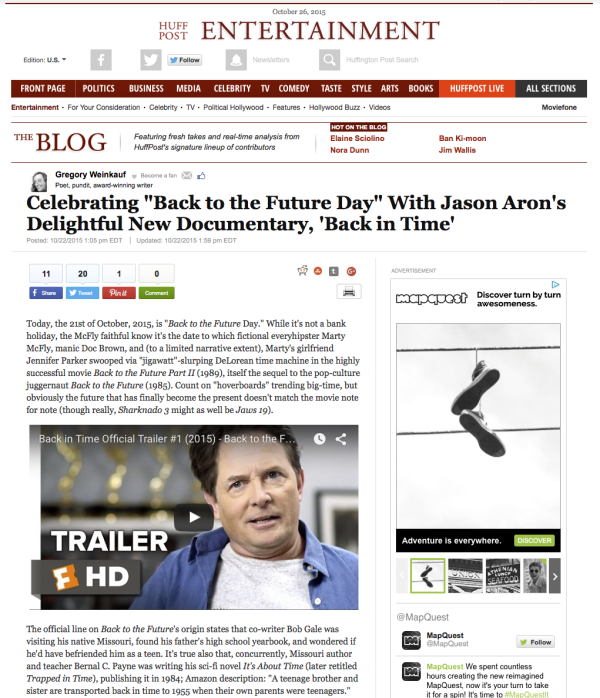 The new documentary Back in Time covers the same story of the film as many of the DVD extras do, but elaborates on that with stories about the cultural impact of the films. 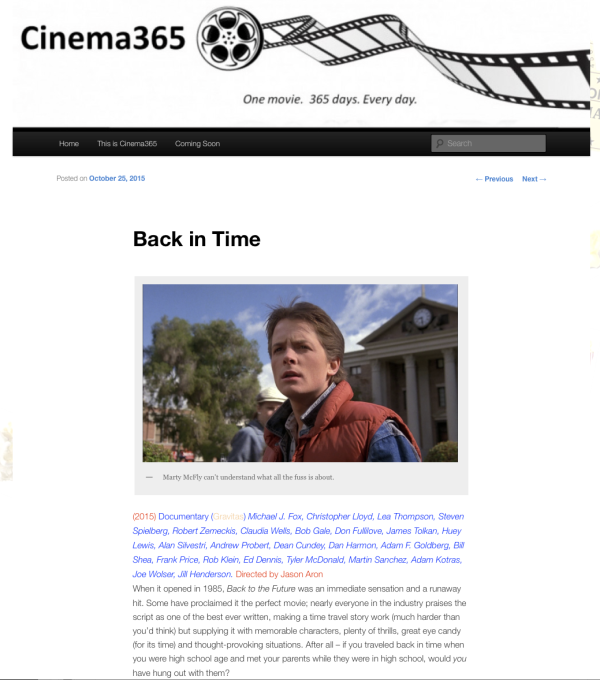 Today, the 21st of October, 2015, is “Back to the Future Day.” While it’s not a bank holiday, the McFly faithful know it’s the date to which fictional everyhipster Marty McFly, manic Doc Brown, and (to a limited narrative extent), Marty’s girlfriend Jennifer Parker swooped via “jigawatt”-slurping DeLorean time machine in the highly successful movie Back to the Future Part II (1989), itself the sequel to the pop-culture juggernaut Back to the Future (1985). Count on “hoverboards” trending big-time, but obviously the future that has finally become the present doesn’t match the movie note for note (though really, Sharknado 3 might as well be Jaws 19). 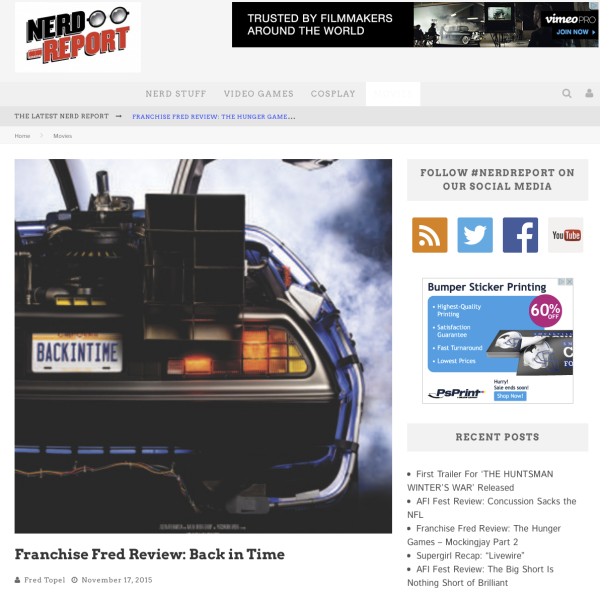 When it opened in 1985, Back to the Future was an immediate sensation and a runaway hit. 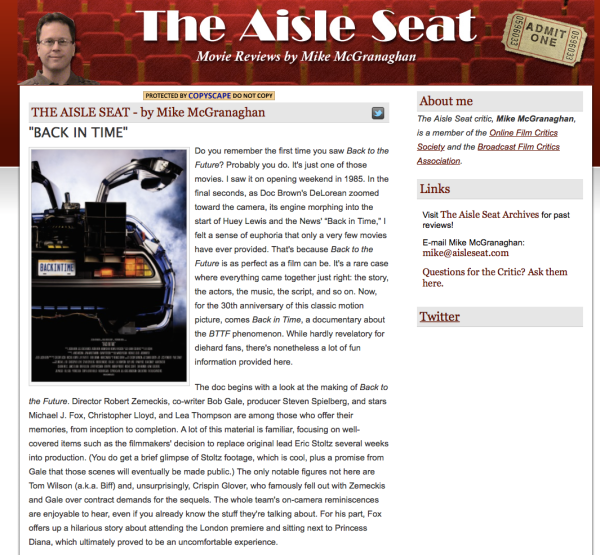 Some have proclaimed it the perfect movie; nearly everyone in the industry praises the script as one of the best ever written, making a time travel story work (much harder than you’d think) but supplying it with memorable characters, plenty of thrills, great eye candy (for its time) and thought-provoking situations. After all – if you traveled back in time when you were high school age and met your parents while they were in high school, would you have hung out with them? 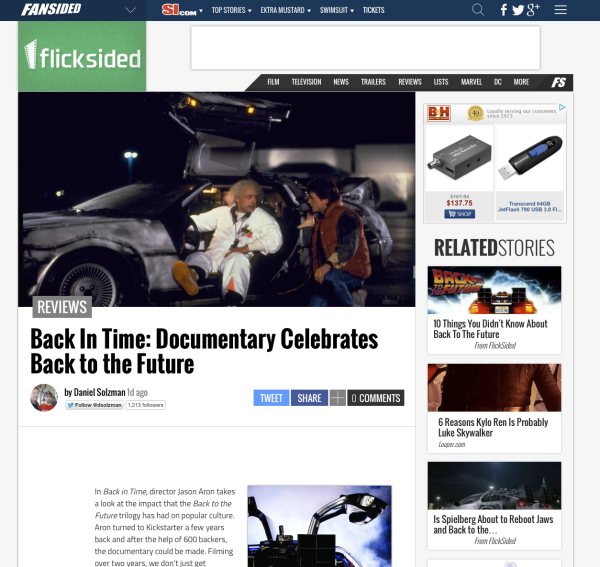 In Back in Time, director Jason Aron takes a look at the impact that the Back to the Future trilogy has had on popular culture. Aron turned to Kickstarter a few years back and after the help of 600 backers, the documentary could be made. Filming over two years, we don’t just get interviews with cast and crew. What we get is actually more than that. We get to see the legacy of BTTF at work. People that own De Loreans get together at conventions to celebrate the franchise. An epic journey unfolds in the 90-plus minutes that the film runs. Back to the Future is a film that has impacted a lot of lives. People consider it the end all, be all trilogy and they defend it in the face of Star Wars adorers and Lord of the Ring loyalists. It’s influence on film and audiences is something that, 30 years later, is as strong as it ever was. Nobody could’ve predicted it. Do you remember the first time you saw Back to the Future? Probably you do. It’s just one of those movies. I saw it on opening weekend in 1985. 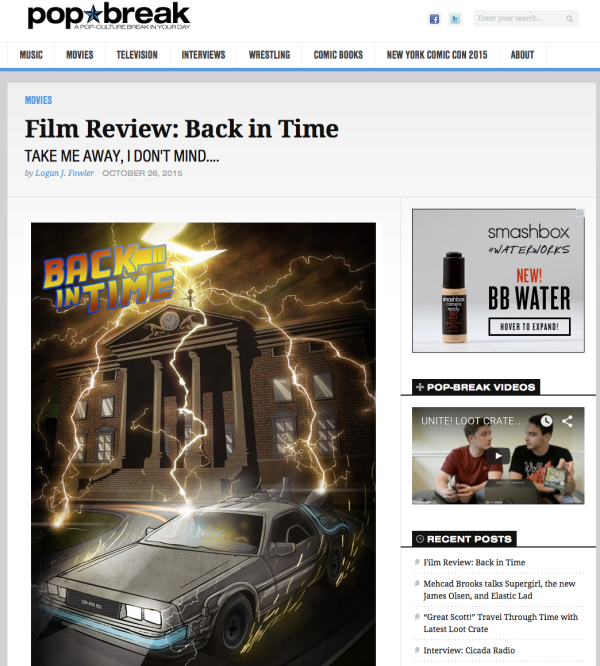 In the final seconds, as Doc Brown’s DeLorean zoomed toward the camera, its engine morphing into the start of Huey Lewis and the News’ “Back in Time,” I felt a sense of euphoria that only a very few movies have ever provided. That’s because Back to the Future is as perfect as a film can be. It’s a rare case where everything came together just right: the story, the actors, the music, the script, and so on. 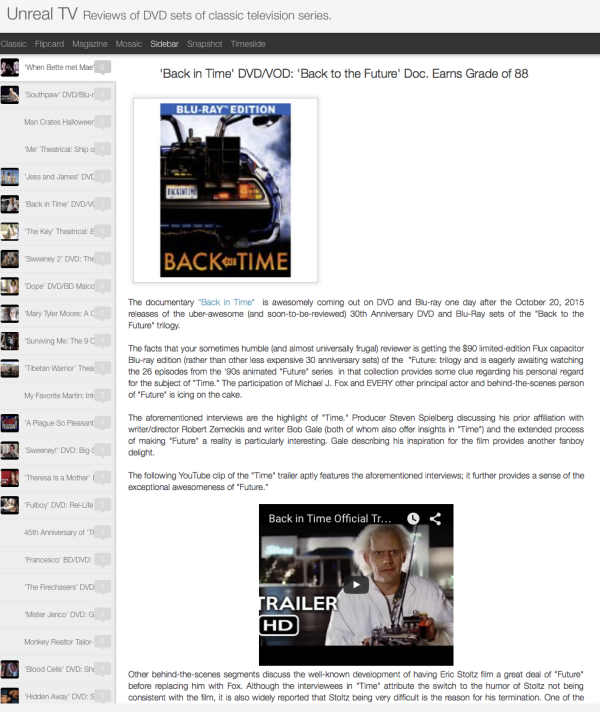 Now, for the 30th anniversary of this classic motion picture, comes Back in Time, a documentary about the BTTF phenomenon. While hardly revelatory for diehard fans, there’s nonetheless a lot of fun information provided here. 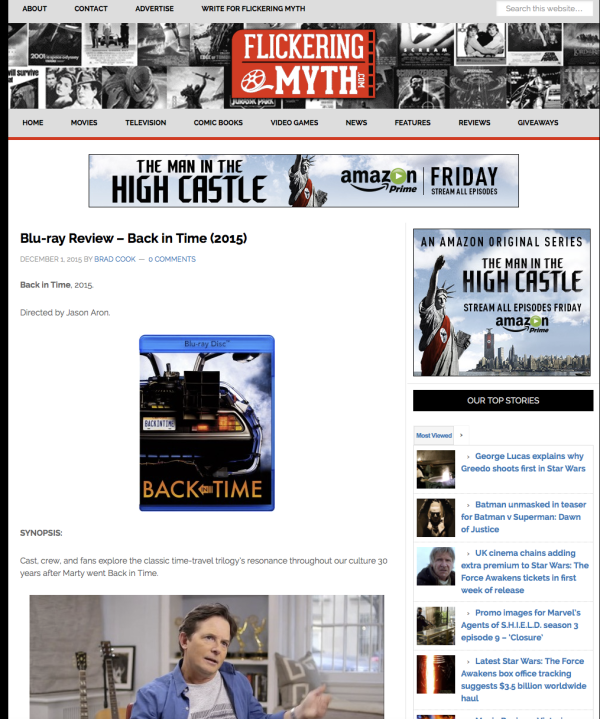 The documentary “Back in Time” is awesomely coming out on DVD and Blu-ray one day after the October 20, 2015 releases of the uber-awesome (and soon-to-be-reviewed) 30th Anniversary DVD and Blu-Ray sets of the “Back to the Future” trilogy.